Many were impressed with this sneaker’s comfortable in-shoe feel. “Stylish” and “cool” were words commonly stated by most users to describe the Nike Air Max 95’s silhouette. The shoe provided ample arch support, mentioned by a good number of reviewers. When used for work, for eight hours straight, this shoe remained comfortable, several users expressed. The Nike Air Max 95 can be worn for any occasion. It looked great dressed up or dressed down, a significant number advised. Nearly all said that they were happy that the shoe was lightweight and sturdy. In fact, those who tried the sneaker for running, daily walking and working out were pleased that the Air Max 95 held up. The shoe broke in fast. A few wearers even mentioned that it felt comfortable right out of the box. Based on some reviews, the sneaker looked the same as advertised online. With different colorways available, it is one of Nike AM’s most iconic and popular silhouettes ever. More than a handful noted that the shoe’s size runs smaller than their usual choice. Some also thought the shoe felt narrow and a bit too tight. After a few months of usage, the stitching on the shoe’s toe box and the material on the upper wore out, a few users complained. With its narrow opening, the shoe was hard to put on, a wide-footed Nike fan disclosed. Few thought the shoe got dirty easily and was hard to clean. A good deal of purchasers considered the sneaker as slightly expensive. Less than a handful said that the shoe made their feet look bigger. The Air Max 95’s upper was not as breathable as they thought it would be, not many expressed. Among all the Nike Air Max creations, the Nike Air Max 95 is arguably the most innovative. Considered as ahead of its time during its inception, this legendary silhouette continues to live up to its reputation for over 20 years. With its iconic status, it is sold at a slightly higher price tag. Still, collectors and Nike fans worldwide are more than willing to pay the cost of this sneaker to enjoy its classic yet highly-fashionable aesthetics and its reliable and lightweight cushioning. The late 1970’s marked Nike’s creation of the revolutionary Air-Sole technology. Nine years after, the Nike Air Max 1 model was born. Featuring a visible air unit on the shoe’s heel, this footwear’s design was already perceived as groundbreaking. However, this was not enough for the brand. Aiming to be the leader of innovation and to recapture the attention of both runners and running enthusiasts, a team led by a trained industrial designer named Sergio Lozano unceasingly pushed their limits to create the Air Max 95, a running shoe that boasts of individuality and improved performance. This shoe’s initial design was inspired by the process of rain eroding the earth and the striations found in the Grand Canyon. Later on, Lozano, taking into account the famous Tinker Hatfield’s words, looked for the story behind his concept and design and found the answer in Nike’s design library. The Air Max 95’s silhouette finally took shape after Lozano read a few anatomy books. With the product’s design essentials being greatly influenced by the construction of the human body, Lozano described the upper highlighted with layered panels as the flesh and muscle fibers, the midsole was the spine and the nylon eyelets resembled the ribs. At the onset, the shoe’s design was met with resistance as it was the first to feature an unconcealed air forefoot unit, a black midsole and a “Swoosh-less” exterior. To add insult to injury, the team also wanted this already unconventional designed-sneaker released in a gradient gray colorway, a color unpopular during that time. However, by adding minimal branding to accent the shoe’s controversial silhouette and through lots of perseverance, the Air Max 95, in time, became a hit among the youth and was later on perceived as a fashion staple throughout Europe, Australia, and subsequently in the US. Two decades after this shoe debuted, the Nike Air Max 95 maintains its iconic status in the market. In fact, over 150 colorways have been released and the brand does not show any signs of abating. This year alone, Nike has introduced several new additions to the growing Air Max 95 line. Its silhouette also continues to influence modern day sneaker’s contemporary design. Stay ahead of the game, whether on the street or on track, when you choose to wear this sought-after sneaker. Released in a wide array of color schemes, this sneaker, with its eye-catching aesthetics, is capable of elevating your style to the next level. Try to wear this with your everyday joggers, jeans and shorts and look great in an instant. The Nike Air Max 95, with a heel and forefoot that feature the well-known Air-Sole cushioning, also ensures to provide lightweight and all-day comfort. With this said, the shoe is considered by many as a reliable everyday footwear. Originally built as a runner and crafted with a textile upper accented with supportive synthetic overlays, expect this shoe to hold your foot better and to provide adequate support in all the right places. Its narrow forefoot, however, provides minimal toe space. Men’s and women’s versions of this shoe are available. Both generally run true to size and width. The editions made for women are offered in sizes 5.5-11 while men’s models are in sizes 6-15. Moreover, Nike Air Max 95 in kids’ sizes are also being sold. Expect the shoe’s noticeable upper to get noticed even from afar. The Air Max 95 is also the first shoe to have an exposed heel and forefoot air bubble. This and the shoe’s PU midsole provide the sneaker with superior cushioning. The famous “Swoosh” logo, originally applied as a punctuation to the shoe’s distinguishable silhouette, is found embroidered on the back quarter of the Air Max 95. This sneaker has a rubber outsole with a Waffle pattern and flex grooves. The former offers superior traction and the latter provides enhanced flexibility and smooth transition. The shoe’s collar is cushioned for added comfort and better support. 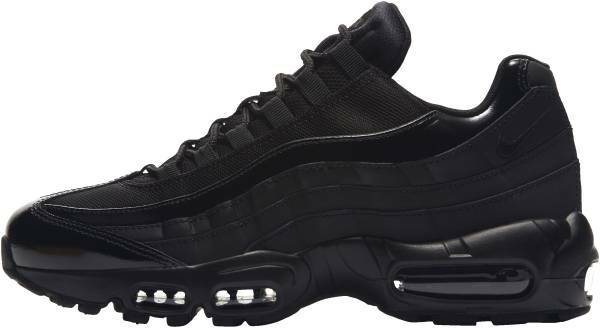 Optimal fit can be achieved with the Air Max 95’s easy lace up closure that includes round laces. Other distinguishable features are the “Airmax logo” on the shoe’s tongue and the “Nike Air” branding found on the shoe’s heel. A customizable version called the Nike Air Max 95 iD is also available. Priced at $200, fans of the brand are given the option to pick the color of the shoe’s upper, lining, medial and lateral lace loops, heel logo and Swoosh, midsole, outsole as well as the Air Bubble. They can also add a logo or a text.